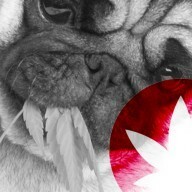 Blog How Can CBD Help With Senior Pet Care? 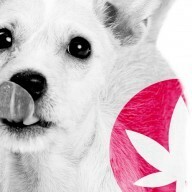 How Can CBD Help With Senior Pet Care? CBD’s rapid rise in popularity is uncovering far more of its potential applications. CBD isn’t only a health-enhancing supplement for humans alone. Many other animals also possess an ECS, the internal system comprised of at least two types of receptors that allows cannabinoids to work within the body in a very specific way. 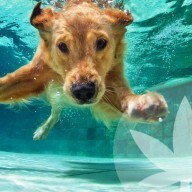 This means that CBD’s anti-inflammatory, immunomodulating, and other effects may be used to soothe conditions that pets suffer from, and to help keep them healthy in general. 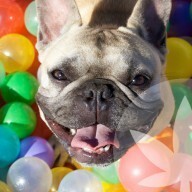 CBD is now marketed specifically to pets in the forms of treats, oils, and other supplements as more positive anecdotal accounts flood the web. Many of the scientific studies confirming some of CBD’s beneficial effects have actually been performed in vivo upon mammals, lending to the argument that the cannabinoid can sustain notable effects upon our furry friends. Pets may develop illnesses over the duration of their lives, and will start to experience certain health conditions later on in life during their older years. 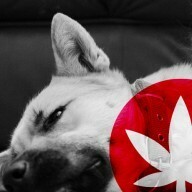 CBD can be a good addition to your ageing pet’s health regimen, assisting them with age-related conditions. Although CBD is certainly experiencing more media attention, many people aren’t familiar with the breadth of its benefits. Some may still be under the impression that CBD is a psychoactive substance like THC, and will therefore scrutinise it prematurely. However, CBD does not cause any sort of high, and as such, has been successfully administered to children, the elderly, and pets. CBD, like a variety of other cannabinoids, works in the body by interacting with receptors that make up the endocannabinoid system. Cannabinoids are structurally similar to endogenous chemicals created within our bodies (known as endocannabinoids), allowing them to interact with the body via the same system. 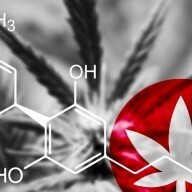 External cannabinoids (known as phytocannabinoids) like CBD are known to “supercharge” this system and fulfill similar roles to their endogenous counterparts. 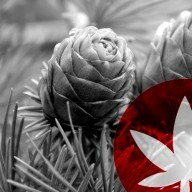 In other words, they are known to be biomimetic, used interchangeably with the body’s own cannabinoids. CBD affects the CB1 and CB2 receptors, as well as adenosine receptors, serotonin receptors, the vanilloid receptor, and the capsaicin receptor. The cannabinoid is known for its immunomodulating, anti-inflammatory, anti-anxiety, antiemetic, antiproliferative, anti-ischemic, and bone-stimulating properties, among others. Different breeds of dog have varying lifespans, ranging from about 6 years to 14, give or take. It tends to be true that smaller dog breeds live longer than their larger cousins. For example, corgis and jack russells have a lifespan of around 13 years, whereas rottweiler and great danes live between 7–9 years. However, size isn’t always a determining factor. Regardless of lifespan, a dog that reaches 7 years of age is usually considered a senior. A senior dog can still make an exceptional companion, and after a lifetime of bonding will still of course be a loved and valuable member of the family. However, increased age does often come along with different ailments, meaning dogs may need some extra care in their later years. Cats are pets that also have quite a lengthy lifespan, and tend to live between the ages of 13–17. A large percentage of senior dogs have been found to be overweight. An owner should be able to feel their dog’s ribs when placing a hand underneath their ribcage. Being overweight is not joke for dogs; it can contribute to conditions such as heart disease, high blood pressure, and damage to connective tissues and joints. When it comes to cats, obesity is more likely to occur between the ages of 2 and 10. 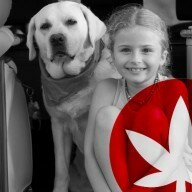 Although they may not be old if and when it occurs, CBD may still be of assistance. 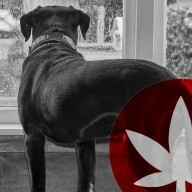 As well as ensuring that your pet engages in regular physical exercise, caloric restriction may also be a necessary step, and CBD can make this process a lot easier for your pet. A paper published within the journal Psychopharmacology states that CBD results in reduced food intake in animal models. Osteoarthritis is another age-related conditioned that dogs can experience. This condition is a result of the cartilage within joints wearing down over years, causing the ends of bones to grind against each other. The friction created contributes towards pain, decreased mobility, and inflammation. Osteoarthritis is also known to be very common within cats and is associated with long-term pain. A paper published in the journal Pain states that CBD could be a safe and useful substance for ameliorating the neuropathic pain associated with osteoarthritis. Additionally, CBD has been shown to prevent the later development of pain and nerve damage in osteoarthritic joints. Glaucoma is a condition that becomes more common in ageing dogs, with some breeds being more susceptible, such as cocker spaniels, samoyeds, and poodles. Glaucoma involves pressure being placed on the eye, reducing fluid drainage. When the condition becomes chronic, the pressure can eventually cause permanent damage to the optic nerve, possibly resulting in blindness. The condition can also occur in cats. Interestingly, cannabinoids such as CBD have been shown to help relieve the condition. They appear to do so by reducing the intraocular pressure of the eye when applied either systemically or topically.